A fitness favourite, the Grappler has been used by athletes and gym users for over 15 years. 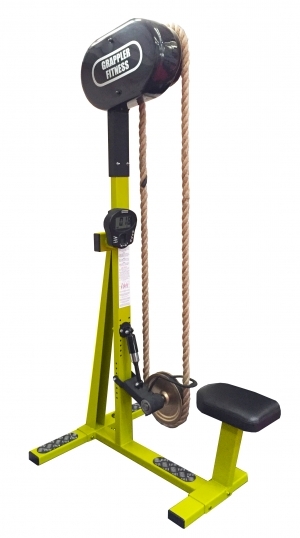 Both innovative and unique this rope pulling machine can provide the ultimate workout in a short period of time. Perfect for strength training, weight loss, muscle toning, general fitness and rehabilitation The Grappler will deliver a great workout with almost no adverse after effects. 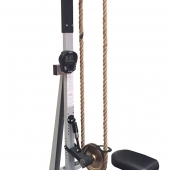 With a compact footprint (H240 x W94 x D140cm) the Grappler is easily placed in any fitness facility or home gym. The heavy duty rope is handmade from natural and biodegradable Manilla and is crafted using a unique and patented loop rope system. New seat for 2016 allows the use to operate the Grappler from a seated or standing position. Manufacturers list price £2999 + VAT. Custom frame colours available upon request.